A two-time All-Nebraska and three-time All-Metro first-team basketball player, she led the Bryan Bears to three state tournament appearances and a runner-up finish in 1995. She was second team All-Metro as a junior and senior in volleyball. Bristol also lettered in soccer and track. At Arizona, the All-Pac-10 player was the school’s career leader in steals (260) and held the No. 5 spot on the all-time scoring list with 1,260 points. 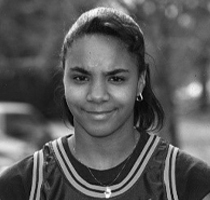 The 50th pick in the 2001 WNBA draft by the Charlotte Sting, she has played professionally for several teams in Europe. She joined SAVE’s Board of Directors in 2009 and has been instrumental in our programming and is a great role model to the kids.